It is important for an organization that the quality of the products is maintained when they are delivered to the customers since the product quality is the top most drivers for the success of the organization. However, in the organization, employees do make mistakes and machines and equipment do have breakdowns. These results into the production process getting destabilize which in turn cause production of the products which do not meet with the requirements specified in the standards and specifications. Hence, there is necessity of inspection and testing so as to ensure that the products delivered to the customer are complying with the specification as required by the customer. Inspection and testing measure and determine the quality level of the products. These are the activities or techniques used to verify the product quality as well to ensure that the results of the manufacturing process are the same as was expected. Inspection and testing activities are done to uncover the defects in the products and reporting to the production management who make the decision to allow or deny product release. Inspection and testing during the process of the manufacture of a product are the most common methods of attaining standardization, uniformity, and quality of workmanship. These are the process of controlling the product quality by comparing it with the established standards and specifications. It is one of the operational parts of the quality control. During the inspection and testing, If the product does not fall within the zone of acceptability then it gets rejected and corrective measures are required to be taken by the production management so as to ensure that the product manufactured further conform to specified standards and specifications. Inspection and testing are indispensable tools of manufacturing process since they help to control quality, reduce manufacturing costs, reduce rejection losses, and assign causes for the production of defective product. Inspection and testing procedures are followed before, during, and after the product manufacturing for ensuring that the level of quality of the product is as per the standards and the specifications. Inspection is an activity which generally occurs outside a laboratory, often at the place where the product is being produced. Inspection is primarily focused on the appearance, construction, and basic function of the product. It is the quality control function which is carried out, during the manufacturing of the product by an authorized inspector. The function includes measuring, examining, testing, gauging or otherwise comparing the findings with applicable requirements. The authorized inspector is an employee who is properly qualified and has the authority to carry out the inspection. On the other hand, testing is carried out in a laboratory which is a facility often installed at a place near the process of manufacture. Testing laboratory is to have capability to measure the needed properties of the product (such as physical, chemical, mechanical, and metallurgical etc.) for ensuring that the properties of the product being produced corresponds to the requirements of the standards and specifications. Testing is normally done by destructive methods of testing. Destructive testing by definition is any test which alters the shape, form, size or structure of the material being tested. The tested part is destroyed in the process and is not available for use. However, the information obtained during testing is usable for evaluation of the products produced in the same batch. Some of the properties of the product can also be tested by non-destructive testing (NDT) methods. For effective inspection and testing during the manufacture of the product, it is necessary that the employees are provided with adequate resources. These employees are to be well trained in the job and are to have support of the management along with the required powers to perform their job. They are to have thorough knowledge of the standards and specifications. The time needed for the proper inspection and testing is to be provided in the production schedule. The emploees are to follow the documented procedures and are to keep proper records. The prime objectives of the inspection and testing are (i) to certify the quality of the product being dispatched to the customer, (ii) to minimize the quality issues with the customer, (iii) to distinguish quality products from those products which are off in quality so that off quality products can be segregated, and (iv) to determine if the process is changing and approaching the specification limits requiring application of controls, (v) to determine the stage of the process at which the product is picking up the defect. Inspection and testing can also be used (i) to rate the quality of the products, (ii) to determine the types of defects in the products, (iii) to determine the causes of the defects, (iv) to measure the precision of the measuring instruments and testing equipments, and (v) to measure process capability. The intent of inspection and testing is to identify anything that is not as per specification, so that production personnel either fix it or eliminate it in order to ensure that the product conforms to the specifications, and has the functions as required under the specification.. Inspection is usually carried out either for the entire materials (100 % inspection) or the selected samples. On the contrary, the testing is normally done usually for the selected samples. In view of this, the sampling techniques are very important for the inspection and testing. If the samples selected are not representative then the results of the inspection and testing will not depict the correct quality of the product. Also, when it is suspected that the quality of the product with in a batch differ widely, then it is always advisable either carry out inspection and testing on a large number of samples or to apply inspection and testing techniques for the entire batch of the material. 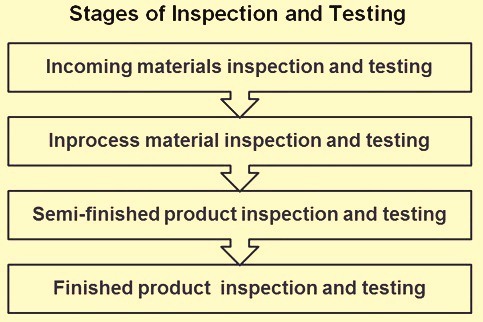 There are normally four stages in the process of manufacturing a product where the inspection and testing techniques are used in order to control the quality of the finished products (Fig 1). These stages are (i) inspection and testing of incoming materials (raw materials), (ii) Inspection and testing of in process materials when the products are in the process of manufacture, (iii) inspection and testing of semi-finished materials when for the manufacture of the product, multiple processes are involved generally operating in series, and (iv) inspection and testing of final product before it is dispatched to the customer. In some cases when customer is not satisfied by the quality of the product, then the inspection and testing is also done in customer’s premises. Inspection and testing of the incoming materials are done for all the materials being received at the plant from the suppliers. It consists of inspecting, checking and testing of all the purchased raw materials and parts that are supplied before they are taken on to the stock or used in actual manufacturing. The accompanied and supporting documentations (e.g. certificates of analysis, test results etc.) received along with the incoming materials are also checked. Inspection and testing can take place either at supplier’s end or after the material has been received at the plant. If the incoming materials are large in quantity and involve huge transportation cost it is economical to inspect them at the place of the supplier. Inspection and testing of in process materials during the production process is carried out while the production process is simultaneously going on. It is done at various work stations of the process or/and at the critical production points. Early identification of defects in the products before they arrive at the final inspection stage increases the efficiency of the entire operation by avoiding further processing of defective products. In-process inspection and testing aims to prevent manufacture of the products of unacceptable quality. It can take the form of (i) first piece inspection and testing, (ii) patrol inspection, (iii) operator inspection, and (iv) last piece inspection and testing. Whenever a production run is started, it is prudent to check the first piece before the main run commences. Many defects can be detected by the checking of the first piece off and this can prevent the whole batch from going wrong. The purpose of patrol inspection is to help the operator to make the whole run correctly. Operator inspection means that instead of the inspector, the operator carries out the inspection during manufacturing. Last piece inspection and testing is carried out on the last item manufactured in the batch. This allows action to be taken to rectify faults in the machine and/or tools before beginning the production of the next batch. Semi-finished material is the product of preceding process and the feed material for the succeeding process in a multi-process operation. Inspection and testing of the semi-finish materials is done to segregate the material which has become off in the specification and to stop its further processing. Inspection and testing of finished material is the last stage when finished materials are inspected and tested and is carried out after manufacture of the product has been completed, with the object of making sure that the products meet the requirements of concerned specification needed by the customer before their dispatch to the customer. These are done to see that the products which do not meet the quality requirements are either rejected or downgraded. The tests to be carried out and the measuring instruments or the test equipment to be used and the criteria for deciding acceptance of the product with respect to each characteristic are to be determined based on the requirements of standards and the product specification. Inspection and testing is to be done as per the sampling plan such as size of sample and the criteria of acceptance to be followed as specified in the standard and specification. It is necessary to exercise suitable control over the movement of the product through the inspection and testing area in order to avoid a mix-up of accepted and rejected products. Accurate instruments and equipments are necessary to perform inspection and testing. Measuring instruments and testing equipment used for inspection and testing are to be calibrated periodically to verify their accuracy. It is necessary that the calibration is linked to some national or international standards. It is necessary to continually monitor the performance of inspectors since the reliability of inspection is very often affected by the inspector. Some defects are more difficult to find and require more patience. Inspectors vary in their ability to detect the defects in the products and the detected defect level which has been reported can affect the acceptance/rejection of the product. Samples with known defects are to be used to evaluate and improve the inspectors’ performance. Training of the inspectors is the most effective way of improving reliability of inspection. For checking the product quality, inspection is normally carried out (i) to find out physical imperfections (such as surface defects and internal defects etc. ), (ii) to check the quantity (such as numbers, volume, and weight etc. ), (iii) to check the physical dimensions (such as length, width, height, and thickness etc. ), (iv) to check the nominal size (usually done for the bulk raw materials), and (v) to check the physical appearance (such as brightness, dullness, rusting, weathering, colour, solid, liquid etc.). Inspection of the product can be carried out (i) on line at the shop floor during the manufacture of the product, (ii) offline in the product storage after the product has been manufactured, or (iii) in the laboratory. Inspection of the purchased materials can be done (i) at the supplier premises, (ii) in the organization before it is unloaded, or (iii) at the material storage. Inspection carried out for the checking of the product quality is mostly non-destructive in nature and hence it is also sometimes called ‘non-destructive inspection (NDI). Only in some cases product deterioration takes place during inspection. Inspection can be done either by the visual inspection or can involve sensing technologies such as dye penetrant test, ultrasonic test or other common methods of NDI. Inspection can be done manually or automatically. Automatic inspection is carried out either by contact sensing instruments or by non-contact optical measurements. Optical inspections are generally automated. Inspection can be accomplished with a direct physical presence or remotely such as a remote visual inspection. Testing of the products for checking the product quality is normally done in the testing laboratories but sometimes it is done at the shop floor by using mobile testing equipment. Testing of the product is done (i) to check the chemical composition, (ii) to check physical properties like density or specific gravity, dimensional tolerances, product shape, and temperature etc., (iii) to check mechanical properties such as tensile strength, yield strength, percent elongation, hardness, impact strength, and fatigue strength etc., (iv) to check the metallurgical properties such as macro and micro examination for product’s macro-structure or micro-structure, and fracture analysis etc., (v) to check the corrosion properties, (vi) to check the electrical properties, and (vii) many other properties which are specific to certain products such as coating thickness in case of coated products, refractoriness and apparent porosity etc. in case of refractories, reactivity in case of lime, TDS and acidity etc. in case of water and many more. Most of the testing methods are destructive in nature but there are some testing methods which are non- destructive in nature. Examples of non-destructive testing methods are magnetic particle testing, radio-graphical testing, electro- magnetic testing, and eddy current testing etc. There are wide varieties of testing equipments and methods. Some involved manual operation such as wet analysis. In such manual operations the experience of testing personnel counts a lot. On the other end of the spectrum, there are fully automated testing equipments which are having computerized controls such as spectrometers and computerized testing machines etc. During the testing of the products, besides sampling method, preparation of the sample for testing is also very importance. A sample which is not properly prepared can cause erroneous results and the tested properties may not be representative. Reports are required to be prepared after the inspection and the testing. These reports are used either for certifying the inspected or/and tested products or are used for taking decisions and corrective measures. The essential requirements of a good report is said to be its unambiguity and reproducibility. Reports are important records which are to be controlled and are to be kept in a safe and secure place. The data of these reports can be analyzed to obtain the trend analysis. The data analysis also helps in the data based decision making.